About: St. Peter Life Plan, Inc. is a Pre-Need DeathCare Company that offers affordable traditional memorial life plans to all segments of society. Since 1970, it has maintained its leadership and excelled in its role as DeathCare Experts in the DeathCare Services Industry through the continuous development of its wide range of memorial products and services attuned to the changing needs of Philippine society. 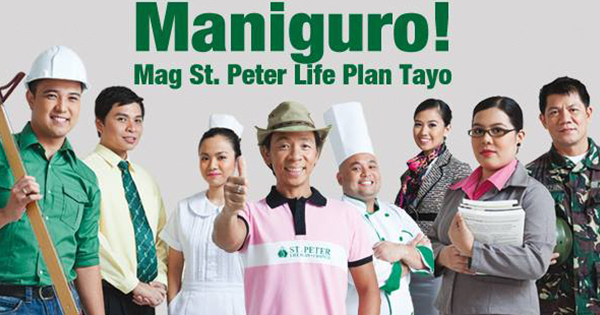 St. Peter Life Plan has several branches in key cities and municipalities nationwide. It is supported by the largest network of memorial chapels in the country, St. Peter Chapels, in the delivery of reliable and world-class DeathCare services. It only entrusts its trust funds to the country’s leading banks such as Bank of the Philippine Islands (BPI), Banco de Oro (BDO), Metrobank (MBTC), United Coconut Planter’s Bank (UCPB), Rizal Commercial Banking Corporation (RCBC) and Security Bank and Trust Company (SBTC) for the protection and security of its planholders. St. Peter Life Plan strongly believes in the quality and value of its memorial products and services; thus, it dares to say that Bawat Pamilya Dapat May St. Peter Life Plan! St. Peter Chapels is a Memorial Services Company established on June 6, 1975. It has been providing professional and traditional memorial services to the Filipino public for over 30 years. It has recently diversified into modern cremation services through the St. Peter Crematorium which facilities are located in selected St. Peter Chapels nationwide. It has also continuously led the memorial services industry through pioneering technological innovations like the St. Peter E-Burol, St. Peter E-Libing and Heaven Address Community Website. St. Peter Chapels has also elevated the level of embalming education in the country through its Embalmers’ Licensure Program (ELP) which is conducted in cooperation with the F&M Review and Training Center. It also takes pride in its customer-oriented Corporate Social Responsibility (CSR) Programs like the FREE Memorial Services to Infants, FREE Memorial Service Gift Certificates for Priests and the St. Peter Casket Donation Program. St. Peter Chapels operates twelve elite Mega Chapels in Araneta Avenue, Quezon Avenue, Novaliches and Commonwealth Avenue in Quezon City, Baguio City, Legazpi City, Cebu City, Tacloban City, Bacolod City, Davao City, Butuan City and Iligan City; and more than 200 St. Peter Chapels nationwide ready to serve the public with reliable and superior quality memorial services.